In a medium skillet, brown the sausage and set aside. In a medium sauce pan mix milk, and salt, then bring to a boil. Stirring constantly, pour in the grits, and bring it back to a boil, reduce the heat and continue to stir until the grits are very thick. Remove from the heat, stir in the butter, then add the cheese. In a large mixing bowl whip the eggs and add the Tabasco Sauce, then add the sausage, then add the grits. Pour the sausage and grits mixture into the prepared baking dish. Bake at 350 degrees for 45 to 50 minutes, until slightly brown around the edge and set in the center. Remove the casserole from the oven to a cooling rack. Let set for 5 to 10 minutes before serving. This will freeze really well for up to 3 months. We cut it in individual serving size then into a freezer bag to freeze. A great individual serving for a busy day. 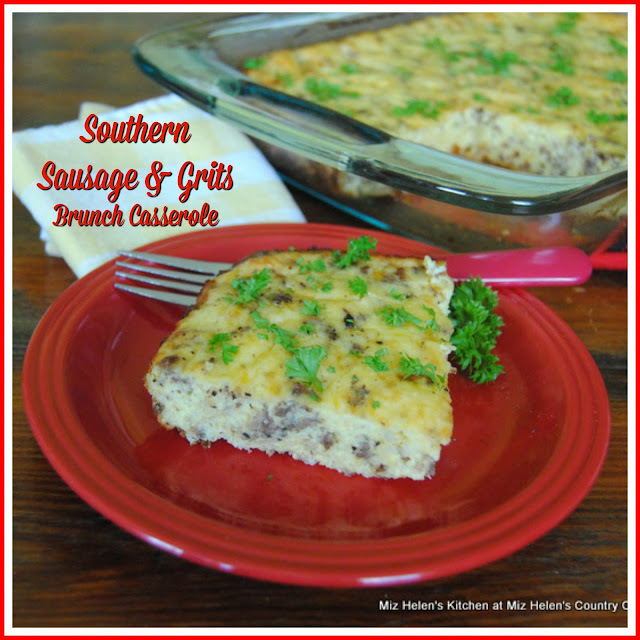 What a great Brunch Casserole and we loved every bite of it. Thanks so much for stopping by to enjoy Brunch with us today. Hope you have a fantastic week and come back to see us real soon! I want to make this Miz Helen! I'm sure it was a hit with the ladies!! Pinning this one - my husband will love it! Thanks for sharing at the what's for Dinner party - Have a great week! I've never made a breakfast egg casserole that had grits. I'm so excited to try this! Sounds scrumptious! Thank you so much for sharing it at Whimsical Wednesdays Link Party. Have a wonderful week! I have been craving grits since I had them with shrimp at my mom's retirement dining room recently. We even went to Golden Corral this past Sunday so I could have grits! Everything else about our breakfast was awful but the grits were good! Guess I need to start making them at home. This recipe looks delicious. Have already pinned. YUM! !